Not long after the announcement of the new Samsung Galaxy S10-series, the company is moving forward with another big announcement. One would argue that it's just as important for the whole mobile industry. We are talking about the first 512GB eUFS 3.0 storage delivering great performance gains over the previous generation. 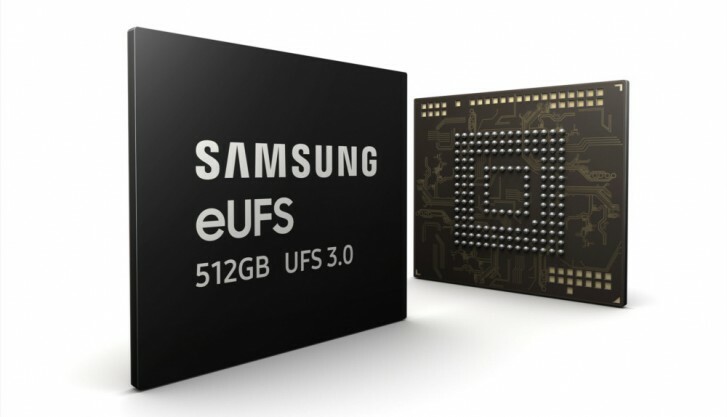 The new 512GB eUFS 3.0 chips are already in mass production and outperform the eUFS 2.1 chips twofold. The executive vice president of Memory Sales and Marketing at Samsung Electronics went even further and said that the new standard finally catches up with today's ultra-slim laptops in terms of storage performance. The 512GB eUFS 3.0 memory stacks eight of 5th generation 512-gigabit V-NAND dies while taking advantage of a new high-performance controller. It can reach up to 2,100 MB/s read speeds, which is twice as fast as current eUFS 2.1 chips. In fact, the read speed is about four times faster than conventional SSDs running on the SATA interface. Write speeds should be around 410 MB/s - in the same ballpark as SATA SSDs. The IOPS have also seen some gains - 63,000 random read IOPS and 68,000 random write IOPS. For comparison, that's about 630 times faster than microSD cards. In addition to the 512GB chips, Samsung is now producing 128GB chips as well and has plans to start manufacturing in 256GB and 1TB flavors sometime in the second half of this year. My western digital 2TB and 2,5 inch portable harddrive can now be bought for around 70-80 euros. I really dont think a 450 dollars card is neccesary. It really is. Think about it, your average NVME SSD is the size of a piece of gum. Now the eUFS 3.0 storage is a quarter smaller of that M.2 drive (might be smaller, idk), with speeds that are faster than SATA.